A Toast to the End of Time, Pt. 2: Tiki On! Latkes, Fritters, Cakes…Whatever, Just Make 'Em! I'm sure other shoppers have noticed me eyeing the Brussels sprouts in the produce department with a lascivious gleam in my eye and wondered what in heaven's name I must be thinking. In my defense, it's just that I've been obsessing over contributor Jim Dixon's recipe for caramelized sprouts (below). This might edge out the version with whole grain mustard as my favorite way of cooking the little cabbages. Split a pound of brussels sprouts in half from top to bottom, then cut those halves crosswise into 2 or 3 pieces. 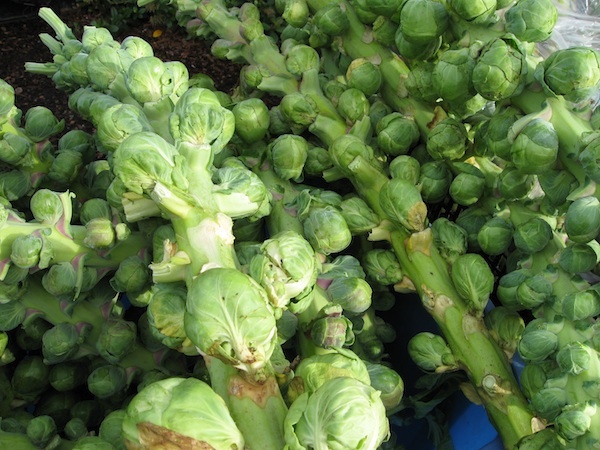 You’ll end up with a pile of coarsely chopped sprouts along with some bits and pieces. Toss them all into a hot skillet slicked with a healthy pour of extra virgin; cook them hot and fast, stirring frequently, until they’ve browned nicely, about 15-20 minutes. Take a red onion, slice it top to bottom, then across once or twice so the pieces are slightly larger than normal chopped onion. Add it to the brussels sprouts after they've cooked for about 10 minutes and are getting nicely caramelized. Cook both together for maybe 5 minutes, then add a dozen or so chopped fresh sage leaves, a tablespoon or more of Katz Trio red wine vinegar, about the same amount of good honey, and a couple of good pinches of sea salt. Cook for another 5 minutes. Eat.